Before I had three kids in tow, I would typically go to Colorado each summer to go hiking and hopefully summit a mountain. I would look forward to it all year, imagining what it would be like to walk along rushing mountain streams, through thick aspen thickets, on up above the tree-line to where few seldom travel. The crisp mountain air and the absence of an ever-buzzing cell phone beckoned me as I prepared for this trip. Getting to the trailhead was always so exciting. But then, reality hit. The packs are heavy and uncomfortable. The weather is unpredictable. The air was way too thin. My lungs are far too small. The altitude made me sick. It was cold. The food stunk. You see, I typically only think about the trailhead and the peak. All of the things in between aren’t really front of mind when considering a summit. It’s the glory I’m after, not the pain. Recently, I’ve been introduced to a concept called “grit”. When I first heard about it, I thought it was more along the lines of resiliency. The resiliency trait focuses on a person’s ability to overcome challenges and recover well from setbacks. It’s more about keeping ones head about them as they face the normal stresses of life. 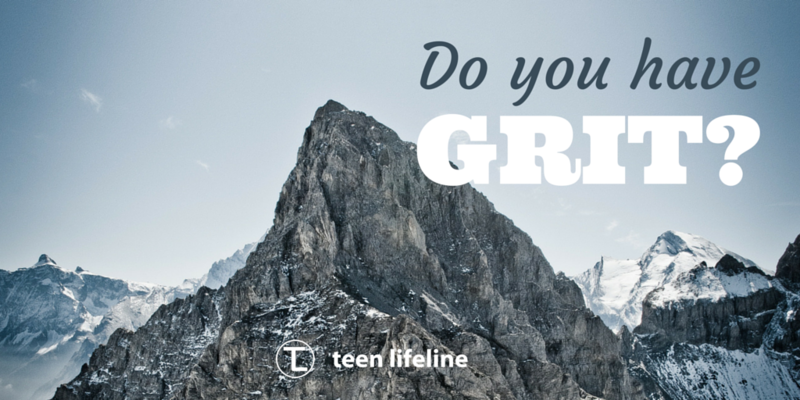 It’s a crucial trait for a teenager to develop as life is full of challenges and difficulties. Those who are resilient will tend to rise above their circumstances and not give into substance abuse or anxiety. Yet, “grit” is something that builds upon resilience. It’s more of a long-term indicator of success. “Grit” can be seen as a tendency to sustain interest and effort towards long-term goals. It is more than overcoming the challenges of life as a matter of routine. We find those with “grit” having the big picture in mind and having a plan or set of goals to get them there. They know what they want, and no setback or failure will stop them. In fact, those with “grit” would know setbacks and failures are part of the journey. We live in a fractured world that contains a lot of uncertainty. Paths are less certain to success, so many who are young struggle to have any kind of “big picture”. In her short TED talk on “grit” and education, Dr. Angela Duckworth talks about this factor being unique in successful individuals, no matter socioeconomic, cultural, or educational level. What is interesting about this talk is her own admission about how little they know about building this trait. There is very little doubt this trait is a factor in success, but understanding how to create this quality remains a bit of a mystery. Yet, as I listen to this talk as well as read more on the subject, one factor continues to pop out. The individual with “grit” has a very clear and defined idea of what the “mountain top” looks like. They have dreamed about it, studied it, and have made it a part of who they are. It is paramount to their personhood that they find their way to this goal, no matter how long or difficult. “Grit” is about vision and motivation, and figuring out what it will take to get there. As helpers of teenagers, we need to be in the business of helping students clarify their own visions for the future and help them do what it takes to get there. Point them towards others who have “grit”. Identify the fears. Encourage them when they fail. But, never let them quit. So, what do you think about the concept of “Grit”? Do you have it? Take this quick quiz and see what it says!